We believe in the power of work and the potential of young people. Unfortunately, too many young people want to work but lack the education, skills, and confidence they need to get and keep a job. Unless someone gives them a chance, they will remain trapped in a cycle of poverty. The stakes are high — youth who are not connected to a career pathway by age 25 will likely face a lifetime of struggle with a high risk of unemployment, poverty, and homelessness. This is projected to cost the economy $93 billion annually in lost revenue and increased use of social services. Juma is a nonprofit social enterprise that operates businesses with the purpose of employing young people. We make sure they EARN a paycheck, LEARN to manage their money and gain essential skills like responsibility, teamwork and how to communicate in the workplace. Ultimately, we CONNECT them to their next job and set them on a path to a career. Our YouthConnect program focuses on low-income transition-aged youth (ages 16-24), who are at risk of disconnection from school and work. 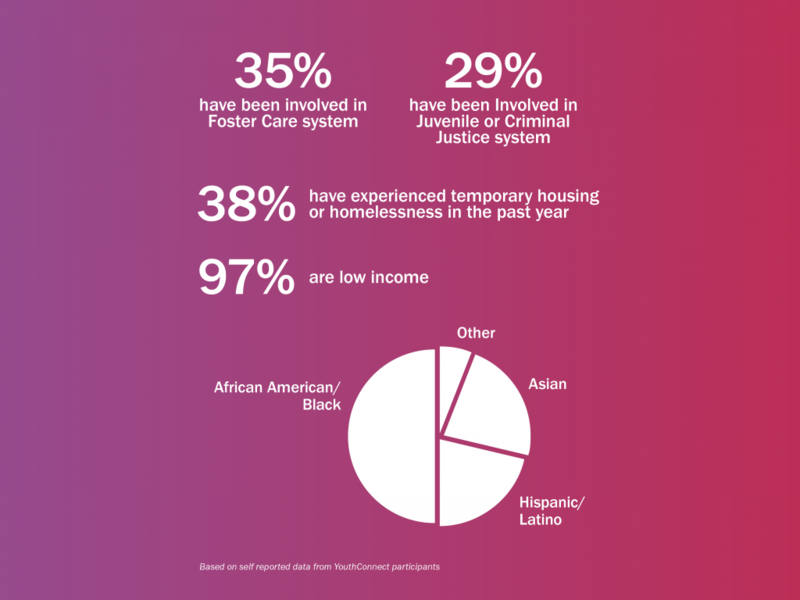 Referred to as Opportunity Youth, many of these young people grew up in poverty, have a history with foster care or juvenile justice, and have experienced significant trauma. As a result, they face a multitude of barriers to employment. Our vision is that all young people have the opportunity to succeed, advance and thrive in the career of their choice, competing in a job market that is inclusive, equitable, and diverse. FROM BEN & JERRY’S TO SPORTS ARENAS. 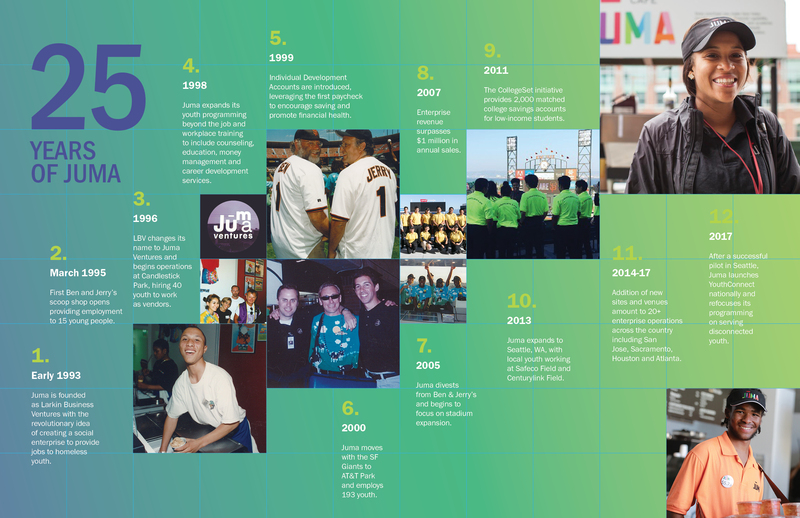 In 1993, Juma Ventures launched its first social enterprise: a single Ben & Jerry’s ice cream shop in San Francisco. 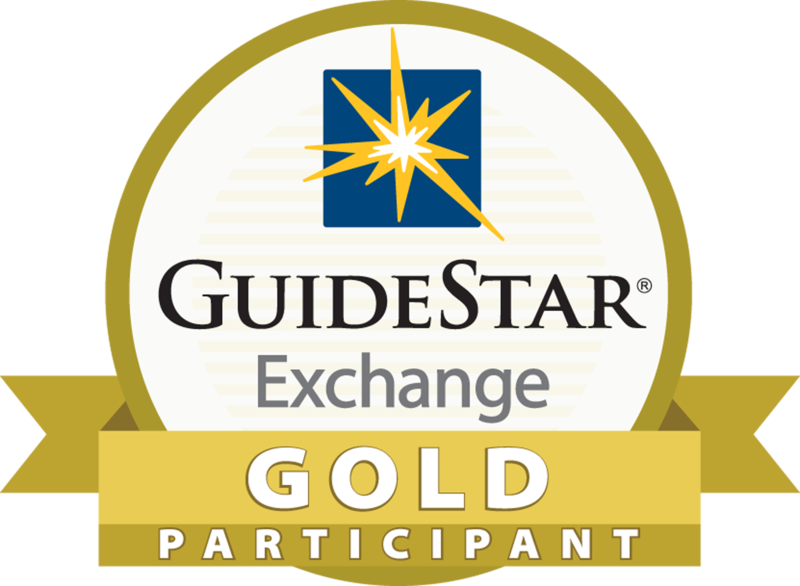 The initial enterprise gave homeless youth the job experience they needed to transition from living on the streets to a stable adulthood. Juma has since grown from a job-training and placement program serving a handful of youth to a comprehensive, award-winning, national youth development program and is considered one of the nation’s premier social enterprise programs. 6 CITIES. 20+ SOCIAL ENTERPRISES. Today, Juma owns 20+ social enterprise operations and serves over 1,200 low-income youth per year in six cities — Atlanta, Houston, Sacramento, San Francisco, San Jose, and Seattle. Partnering with major sports and entertainment venues, asset-building and educational partners across the country, Juma offers youth: employment, financial capability, career coaching and connections to education and career pathways. As one of the country’s largest youth-run social enterprise operations— and the first to provide financial capability and matched savings accounts to teens — Juma has employed over 7,200 low-income students who have generated $34 million in enterprise revenue, earned $9.5 million in wages, and saved $6.2 million for higher education.